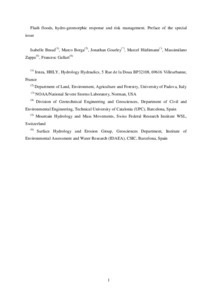 Braud, I., Borga, M., Gourley, J., Hurlimann, M., Zappa, M., Gallart, F. Flash floods, hydro-geomorphic response and risk management. "Journal of hydrology", Octubre 2016, vol. 541 part A, p. 1-5.